This week I have mostly been … reading books. 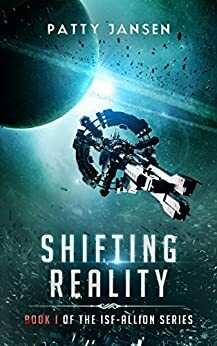 Over the last month or two I’ve been trying to find some books in my genre — humorous science fiction fantasy — and give them a read, mainly with a view to having something of a similar ilk to my own books to share with my mailing list. If I’m just giving readers the heads up about one or two books, as opposed to a group author promo or a group giveaway, I like to make sure I’ve read and enjoyed them, myself. So, with apologies to any of you reading who receive my newsletter, as well, here is a bit about the latest couple I’ve read. These two books are polar opposites; about as diverse as you can get, although I enjoyed both of them, each on its own merits. And strangely, if you like my books, they do tie in with different aspects of my approach; the first, with the humour and the second with my obsession about the idea of grey; of life — and politics — being more complicated than the nice, simplified, sound‐bite, black‐and‐white politicians and the media would have us think. First up, if you enjoy things paranormal and you are looking for a nice, light, easy bit of escapism, I have just the thing for you. Bearly Awake, is a romantic comedy by D. R. Perry. The story follows two main characters: Bobby, a bear shape shifter, who suddenly feels a very strong urge to hibernate just as he is supposed to be cramming for a crucial end of term exam. And Lynn, pointy‐brained human who has a habit of alienating people with her excessive sarcasm. Will Bobby stay awake and pass or sleep, and be thrown out of college? Only Lynn can help him. Both are at the Providence Paranormal College; the best‐of‐the‐best and only one of it’s kind, but Lynn feels that her inability to bear fools gladly has made her as unpopular there as at home, so she has put in for a transfer to a university nearer to where she’s from. Then Lynn’s tutor gives her the task of being Bobby’s study buddy to get him through the exam. Things are complicated further by the fact that even though Lynn thinks he’s way out of her league, Bobby pretty much sets his cap at her. Can Bobby persuade Lynn to stay? Can Lynn keep Bobby awake so he can get through his exam? Now, I confess that, as someone who is a bit leery about paranormal books and (usually) pathologically avoids reading any books with shape shifters (or vampires in case they’re sparkly) I approached this one with some trepidation. However, I really enjoyed it. This book takes the idea of our normal, humdrum world and tweaks it a little into something different and a lot more interesting. I do enjoy that. Likewise, it takes a standard trope — the shifter romance — and gives that a bit of a twist into something different, too. It’s engagingly written, I enjoyed the characters and its gentle comedic style. You also get a feeling of relish coming through in some parts where the author has clearly enjoyed writing it and I like that in a book, too. I also enjoyed the sweet romance aspect, when I didn’t expect to. The story zips along pretty fast. In some instances, I had to back track because I’d missed the point where something was mentioned in passing. That can make it feel slightly rushed in a way. That said I was perfectly able to pick up everything required so it’s no biggie and I’d much rather that than have loads of background info holding up the plot. This was a shorter length novel — about 40k I think. Having read the book, two things have stuck with me: first, the characters intrigued me enough to keep me thinking about them afterwards, and I will probably purchase the next in the series at some point because I like their company. I also spotted the nascent beginnings of a mystery that needed solved and I want to see how they go about it. Second, there were some fun and different ideas which stayed with me, I really liked the special, invite‐only library for creatures who can’t go out in daylight, for example. The juxtaposition of beings at this college, human, shifter, vampire, etc was fun and well imagined. I hadn’t realised how much scope for humour there is in what shapeshifters might turn into, for example, and how it might affect their personalities. All in all it was a diverting and fun introduction to the Providence Paranormal College series. It is what it is, light, frothy fluff, but if, like me, you like a bit of escapist whimsy, you’ll enjoy it. They were taken from the poorest slums in the world to work in space stations. They were promised free food and accommodation. They didn’t know that they, or their children and grandchildren, would never see their home again. Seventy years on, this is the story of Melati, from New Jakarta Station at Epsilon Eridani. Once again, this book steps aside from the usual. Our main protagonist is Indonesian, part of a group of migrant labourers who ended up on a space station so far from Earth that they will never be able to return home. What I loved about this book is that you get so immersed in another culture, and a completely different one to that which you might expect. Some of the stuff about food made me hungry, the plot is clever and intriguing, the political situation seems incredibly realistic, in a good way. We’re not talking gritty, well, we are but not in an everyone must die horribly and all the characters are loathsome miserable bastards kind of way. It’s gritty in that life on the station is hard and Melati our heroine, is stuck between her own community and that of the officers and staff running the station — who live in a different part of it, in far more comfortable circumstances — while Melati’s family, and her people, are living in on the lower decks in a slum. The basic premise is untangling a mystery, and as Melati tries to solve it, her efforts bring politics closer to herself and her family than she’d like, and of course, it also brings her into conflict with her family and challenges her loyalty to her employer, the International Space Force. Things get fraught. As Melati gets closer to the truth there are murders. People she loves suffer and she has to somehow walk the line between two polarised social groups to solve the mystery against a background of rising political tension. But above all, as much as it is a mystery, and sci‐fi, this story is about the complicated nature of existence: being who you are, trying to fit in, trying to change your life or advance your fortunes without losing sight of your roots and your soul, attempting to look after your family and do what’s best for them when they’re buggered if they’re going to let you. It’s about the hard reality of attempting to stay in the neutral ground between two groups of people, both of whom you care for, when neither of them much cares for one another, without compromising what you believe is right. In short, though set in space, in the future, it’s about the daily business of living life on Earth right now. I loved the whole complicated mess of Melati’s life, and the way she tried to make sense of it. I’ll definitely be reading the others. If you’re looking for an even bigger bargain, I’ve just picked up the first book in Patty Jansen’s Ambassador Series; Seeing Red, for the knock down price of 99p/99c etc. It’s on promotion to celebrate the release of the latest Ambassador instalment — book six, I think. I haven’t read it yet, but I mention it here because if you think you like the sound of Patty Jansen’s style and don’t mind where you start, you could save £1/$1 starting with the Ambassador Series first. Bla, Bla, Bleargh… At Last! Two #KindleFire #Giveaways and a book recommendation.